I made this mix because having accompanying music helps me write and I was in a bit of a rut. But this definitely helped me, I hope you enjoy it! The descriptions of why I chose the songs are potentially spoilery for the story. Also, the songs are meant to be in chronological order. Louis, Dolce Gabbana, Alexander McQueen, eh ou. This is Miranda's song, it's her anthem about the fashion industry and the world she lives in. Included because how could I not include a couple of Donna and the Dynamos, right? Also, I picked this one because it explains why I chose Las Vegas for their meeting. Also the thing where Donna wants to meet and marry a rich man. Right idea, wrong gender. It could turn into the rest of our lives. Put your lips on mine, baby. I chose this song because Miranda's taking a chance with her reputation, they're both taking a chance with their hearts... cliché... maybe, but it's true. It's also important because these are two women who have some trust issues from being let down so many times. Reaffirming the sentiments that have been mentioned thus far. They've both been burned plenty of times. But they are definitely falling head over heels for each other, despite their differences. I thought of this one for when they part company in Las Vegas. They both expected it to be a vacation fling but it became something that was difficult to walk away from. Vacation is over and they both know that they should forget about each other. But it isn't that easy. Emphasis on the physical distance between them. Miranda feeling like things have changed, the way she feels about everything has changed, she's feeling introspective and unsure about the things she'd always thought she could believe in. Another gratuitous insertion of a Donna and the Dynamos song. Miranda and Donna both have to admit that they were defeated by a stronger fate, that they can't shake the feelings that they have for each other. I chose this song because the lyrics seem to really capture how I imagine Miranda. She knows that Donna's kind, purely good heart has really made her feel differently. She wants her in her life and she likes the way Donna has made her more open in every way. Just for kicks. It was because of this song that I thought of the dancing when they were at the party in Milan. Donna to Miranda, telling her to just dance, it's fun, there's no need to complicate things. Just dance. Sweet and sentimental. 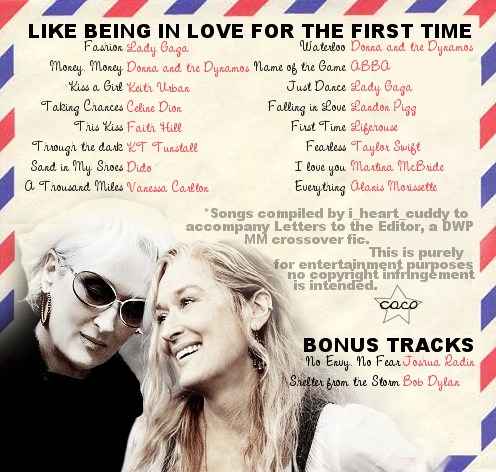 Donna and Miranda are realizing that they have real feelings for each other. They are also realizing that they really understand each other and it's a very real sort of love because it's very honest. I'm taking a chance,letting you inside. More mention of taking chances, anyone else sensing a theme? Donna is really the first person who challenged Miranda in a romantic way (because canon already established Andy as a challenging employee ;]). She's not fake or selfish, she doesn't have a hidden agenda, she's not interested in her because she's famous. And because it's the first really honest love of Miranda's life it feels like the first real love. For Donna their love is the first of her adulthood, she went into it with her eyes open and without any youthfully unrealistic expectations. Giving in to all the feelings, acknowledging that their relationship is one of the best things that had ever happened to them and they don't have any more fears surrounding it. Head over heels. They'd both thought of themselves as really level headed women who don't easily get wrapped up in emotions but their relationship definitely broke down those beliefs. They need each other. They love each other. Period. 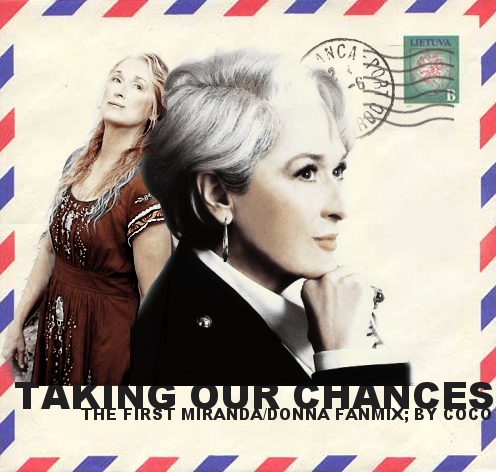 This is a bonus song because I really had the Serena/Emily storyline in mind when I added this to the mix but I also think it works for Miranda/Donna. I like it because it talks about having to give up your fear and your envy to find what you need, what you're looking for. You can't hold onto your fear and still be happy. Another bonus song because it is for the whole cast of characters. They all have trouble really letting people in but they often forget that there is always shelter from the storm in a loving friend or a lover. Someone is always there for you. Andy and Miranda as friends, Emily and Nigel as friends. Two sets of people that became friends in a time of need.